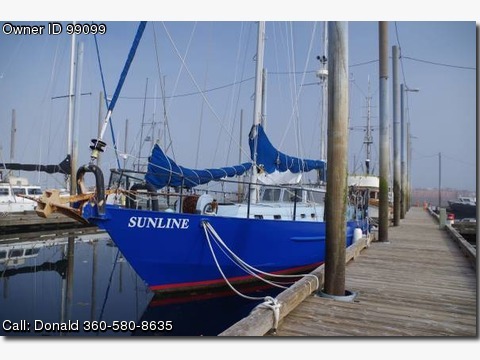 Please call boat owner Donald at 360-580-8635 or 907-846-4107. Boat is located in Craig, Alaska. Steel, pilothouse, Webasto heating system, full size frig, stacked washer and dryer, heavy duty stainless steel railing, Carries 1650 gallons diesel fuel, 700 gallons water. Cat D330 with less than 1000 hours completely rebuilt in 2010, keel cooler, Hydraulically adjusted Feathering prop. Hydraulic anchor winch, AM/FM with CD, 2 bilge pumps, Robertson auto helm, Coast Guard pack, compass, dockside power, full gauges, generator, head, H&C water, VHF, radar, storage, TV/DVD, 11 batteries, 2000w inverted w/battery charger, 48D, 427, 24 volt, documented, slip available, prof. maintained, sleeps 6.